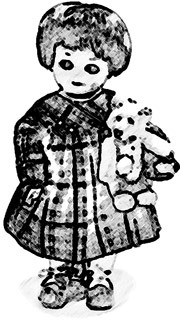 Ursula Alber’s chief purpose in fostering interest in valuable childrens‘ toys from the past is to bring enjoyment and appreciation of life’s special joys. Already at the age of 16 she joined her parents in their Zürich Doll Clinic, and after her apprenticeship at age 21 took over management of the business. 20,000 dolls went through her hands and are recorded in her database. 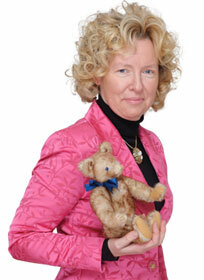 Frau Alber’s special love is primarily the wonderful animal toy figures and teddybears of the House of Steiff. Her first purchase, a monkey (bought for 1 Frank), is still in her possession and lives in the company of a constantly expanding circle of distinguished rarities. Ms. Alber is well-known in the toy scene. She has taken part in establishing price databases and has called into life a major toy show in Zürich. The range and volume of her expertise and knowledge can be summarized under the broad concept of „Toys for Girls“. She is well informed and knows all the ins and outs about these nostalgic well-loved play things – from doll houses to Steiff cats.